Thank you for taking the time to read our profile and getting to know us a little better. We recognize that if you are reading this profile, you may be in the midst of making a difficult decision. We have always known that we’ve wanted children, but were never quite sure it was possible until now. We are an open minded couple who would be happy to adopt a child of any race, ethnicity, or gender as we will work hard to ensure the child is honored for whoever they are. We are committed to honoring your adoption plan as we want what is most healthy for the long-term wellbeing of everyone involved. As for us, we met in 1997 and have been supporting each other on our various educational and career adventures ever since and look forward to continuing to support each other as we welcome a child into our home. We see ourselves as parents who can provide a loving, stable, nurturing, fun, environment for a child to grow into a successful adult. We are a family oriented and outgoing couple who is fortunate enough to have an extensive support network of family and friends who are just as excited as we are welcome a new family member. We are also fortunate enough that one of us will be able to stay home with the child for the first few years. We have a number of holiday traditions that involve family and friends that will only be enhanced by the addition of a new family member. Education has always been important to both of us. 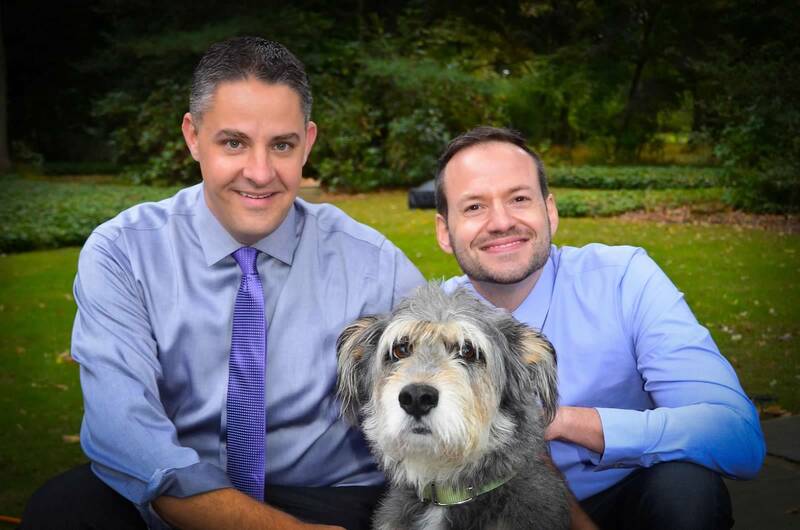 Stuart has Ph.D. in counseling and works as a Professor and Victor has a Master’s Degree in Library Science and also works on a college campus in the Office of Community Engagement (free college tuition!). We are fortunate in that we love our jobs and the flexibility they will provide us to care for an infant. As we both value education, we hope to instill a love of learning in our future child, both out in the world and in the classroom. We both grew up in rural areas and visit family there often, but are just as comfortable with weekend visits to the city. We currently live in suburban NJ neighborhood in a traditional colonial home which has a large yard with ample space for play and future treehouses, sandboxes, pets, and swing sets. We currently share our home with our adorable terrier mix, Lily (we may be biased, but she really is adorable). In our spare time we enjoy traveling near and far, hiking, cycling, reading, gardening, cooking, attending sporting events, and going to the beach. We often combine our love of travel and family by combining both. We look forward to supporting our future children in whatever they decide to love. We know this decision is an important one and we would be happy to answer any questions you might have. Thank you for considering us!